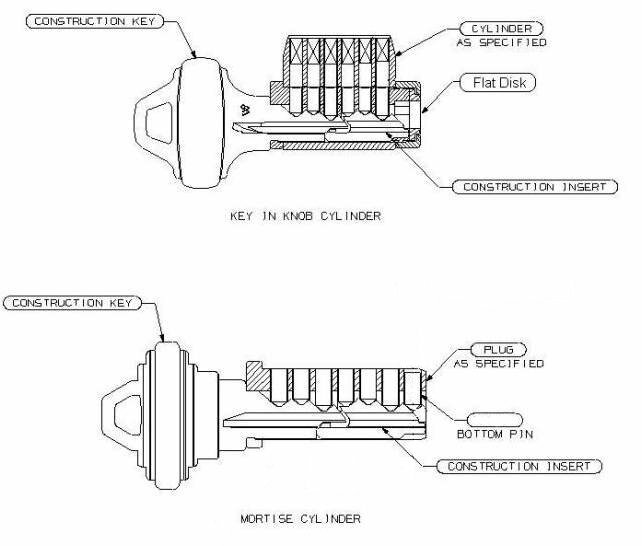 Resolution: With split key construction keying there are two ways the construction insert is retained in the cylinder so that it won't fall out the back end of the plug, see Figure 1. The key in knob cylinder utilizes a flat disk (C603-098) placed at the back of the plug in most cases. Some cylinders do not require the disk because the tailpiece takes up the extra space under the retaining cap. Mortise cylinders use a modified plug that is drilled for a seventh bottom pin (this pin is 34-309, a #9 bottom pin) and this bottom pin prevents the construction insert from falling out the back end. This modified plug is not available for order separately and split key construction keying can only be done at the factory.